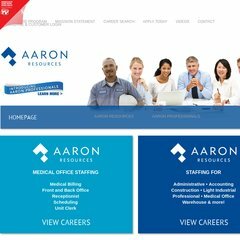 Topics: Aaron Healthcare, and Direct Hire. aaronjobs.com Direct Hire Program - Employment Services Staffing Services ..
aaronjobs.com About Aaron - Employment Services Staffing Services Healthcare ..
aaronjobs.com Employment Services Staffing Services AaronJobs.com - Full Service .. It has 2 DNS records, ns2.dot5nameservers.com, and ns1.dot5nameservers.com. Its local IP address is 66.96.133.23. It is hosted by The Endurance International Group Inc (Massachusetts, Burlington,) using Nginx web server. PING www. (66.96.133.23) 56(84) bytes of data.